✔ Built-in extra storage layer, you can store your laptop, book, phone, and tablet. ✔ No assemble needed, can be open and folded in a few seconds. 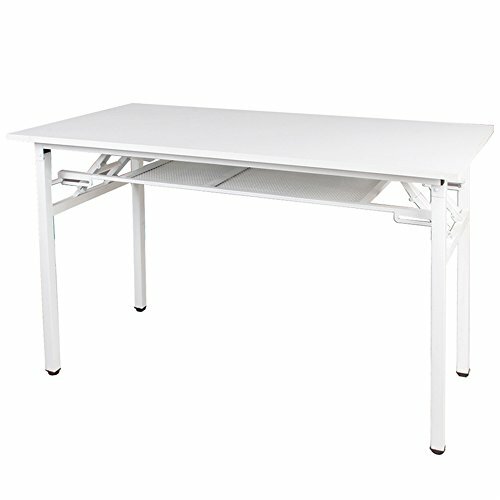 Tips: This desk is assembled, you only need to open and folded the desk in a few seconds. 【Dimensions】: 47.2L * 23.6W * 29.5H inch (120L * 60W * 75H cm); Package weights about 42.1 lbs (19.1 kg); Maximum load capacity 300 lbs (136kg). 【Reasons to Purchase】: Built-in double spring technology to improve stability, security; Come with height adjuster (1-2cm), also can be used for uneven ground conditions; Ultra-thick metal steel frame to provide the ultimate stability, and beautiful & durable paint. 【Elegant & Decent & Steady】: Modern simple fashion, built-in extra storage layer, you can store your laptop, book, phone, and tablet. No assemble needed, can be open and folded in a few seconds.